Rare and unique, Malvasia di Bosa is an oxidative-style wine, like Sherry, but from Sardinia. Columbu estate, featured in Mondovino, is the top producer of Malvasia di Bosa. The estate’s Riserva is a wonderful aperitif and after dinner drink, but matches well with anything involving capers, smoked fish, honey, shellfish and olives. Make no mistake about it: Malvasia di Bosa is one of Italy’s most exciting wines. Unfortunately, it’s also one of the country’s rarest. Nobody makes a better Malvasia di Bosa than the Giovanni Battista Columbu estate, the recognized star of the denominazione. In fact, a star in more than one way, given the estate was prominently featured in the 2004 documentary movie Mondovino. Malvasia di Bosa is the name of an Italian wine (and denomination) made with the Malvasia di Sardegna grape (95% minimum) grown in the countryside of the townships of Bosa, Magomadas, Flussio, Suni, Tinnura, Modolo and Tresnuraghes, all in the province of Oristano on the western coast of central Sardinia. Bosa especially is one of the most charming towns in what is one of Italy’s prettiest regions, the Caribbean-like places on Sardinia. Located on the north bank of the Temo River, the current city was founded in 1112 but was the site of Phoenician settlements already thousands of years ago. I strongly recommend a visit, as the old cobblestone alleys, pastel-colored storefront, simple family-run restaurants and beaches make it a lovely vacation destination. Of course, it helps to know that the area makes some lovely, memorable wines too. Malvasia di Bosa is made in different styles. The official guidelines allow production of a Malvasia di Bosa Amabile or Dolce (which means off-dry and sweet respectively, but this wine is usually off-dry), Passito (super sweet made from air-dried grapes), Spumante (sparkling) and Riserva. As its name implies, the Riserva is meant to be a more structured wine and requires at least two years of aging before release, one of which has to be in wood. It is the most important wine of the appellation, although I have had some interesting Dolce, Passito and even sparkling versions as well. Just like Sherry, Marsala and Vernaccia di Oristano, Malvasia di Bosa Riserva is a member of the oxidative category of wines. 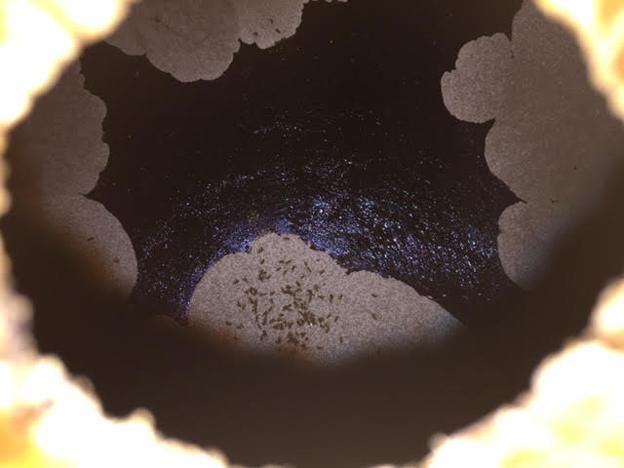 It is aged in partially filled (85%) open top chestnut casks in which a film of local yeasts (flor) develops causing a controlled oxidation process to take place over many years. This group of wines boasts remarkable complexity and depth but has been unfortunately out of fashion for many decades. While Sherry has become fashionable all over again, the same cannot be (yet?) said for the three Italian wines, the popularity of which is still languishing in the doldrums. This is a real shame, for a well-made Marsala, Vernaccia di Oristano and Malvasia di Bosa can be amongst Italy’s greatest white wines and pairs with myriad foods (for instance, anything involving capers, olives, cured prosciutto or ham, smoked foods, honey, fatty cheeses, dark chocolate, salt roe-bottarga, clams and shellfish in general). A fine Malvasia di Bosa offers reminders of wild fennel, lavender, almond, hazelnut, orange peel, powdered rocks, moss, seabreeze and salt and is marked by a strong aromatic note combining pungent flowers and sweet spices. As the wine always exudes plenty of saline freshness, it makes a wonderfully different aperitif and also a dinner-long companion, allowing one to escape, if just for a moment, the usual Pinot Grigio/Chardonnay/Sauvignon Blanc dictatorship. In short, there are few Italian wines more complex than Malvasia di Bosa. An excellent way by which to determine if a person talking or writing about Italian wine knows anything about the subject is if he or she refers to a specific wine as a Malvasia or Trebbiano. If they do, don’t waste your time and just walk away. There are seventeen different Malvasia varieties in Italy. To speak of generic “Malvasia” makes no sense whatsoever. Each one is very different from the others and gives very different wines. People know not to talk about a generic Pinot because they are aware of the differences between Pinot Blanc and Pinot Gris, but are very rarely, if ever, as knowledgeable about Italian wines. In the case of Sardinia, Malvasia di Bosa is the name of the wine: the name of the grape is Malvasia di Sardegna. A scientific study has apparently demonstrated that Malvasia di Sardegna is not a distinct cultivar but is actually the same as Sicily’s Malvasia di Lipari (and therefore, the official name of the Sardinian variety ought to be the latter). I say apparently because, not surprisingly at all, I have yet to find a single vignaiolo that agrees with this study’s findings (and that goes for both Sicilians and Sardinians, in my memory never before as united as they are on this front.) Actually, I find it hard to disagree with them. While the two cultivars do share noteworthy similarities in the vineyards (both are characterized by scrawny looking, relatively long bunches and small berries, so I can see how it might be easy to mistake them on purely ampelographic grounds), the wines are so radically different that it is hard to accept that the two are “identical” grape varieties. This is true even if wines are made in a normal, non-oxidative style. In any event, there are enough scientists who have gone on record recently about this matter. In my opinion, if and when two supposedly identical grape varieties give very different wines, then the two grapes ought to be considered distinct. And if not distinct cultivars, then I strongly suggest that, at the very least, Malvasia di Sardegna and Malvasia di Lipari must be viewed as two biotypes of the same original variety that have, over the centuries, adapted to different habitats. The result is grapes and wines that are both different from each other. In fact, documents as far back as 1833 show that, at the time, growers believed two different biotypes existed on Sardinia itself; Malvasia di Bosa and the Malvasia di Cagliari, both of which were different from anything growing in Sicily. Giovanni Battista Columbu, a born educator and director of the Unione Lotta Analfabetismo Nazionale (a government institution created to teach people how to read and write) founded the estate in 1950 with the help of Salvatore Deriu, a relative of his wife who was passionate about the local Malvasia wine. 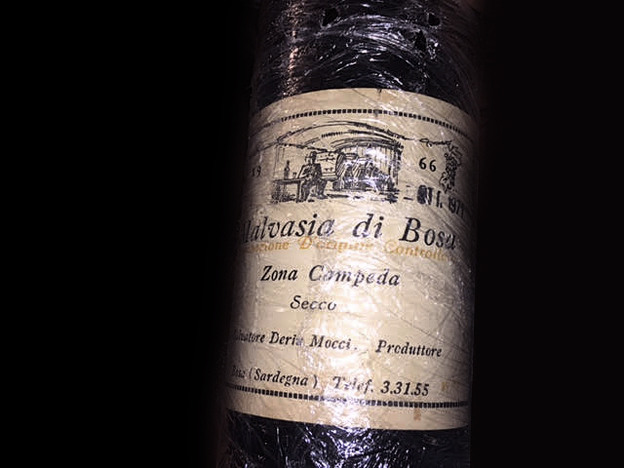 Colombu, thanks to their efforts and their ability to involve other local growers and winemakers, the Malvasia di Bosa DOC was created in 1972. Perhaps just as importantly, Colombu and Deriu insured that the ancient winemaking tradition of the island was saved for posterity rather than lost over time, as the only keepers of this rich knowledge were locals who could not read or write. Giovanni Battista Columbu passed away in 2012. Today, his son, Gian Michele, who had been working at the estate since he was in his twenties, runs the winery. 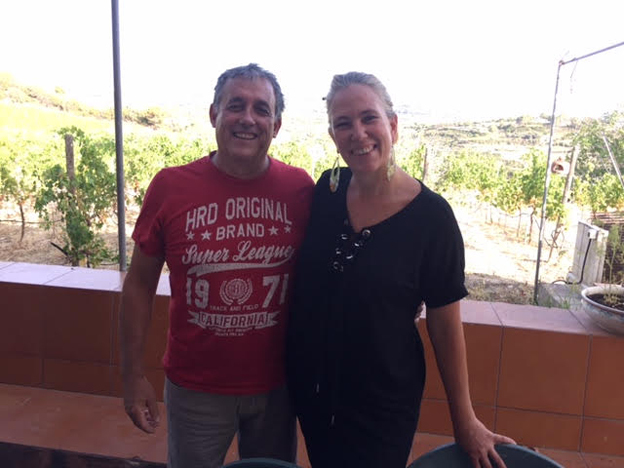 Gian Michele takes care of the vines, his wife Vanna looks after sales, while Gian Michele’s brother, Rafael Battista, is the cellar-master and winemaker. 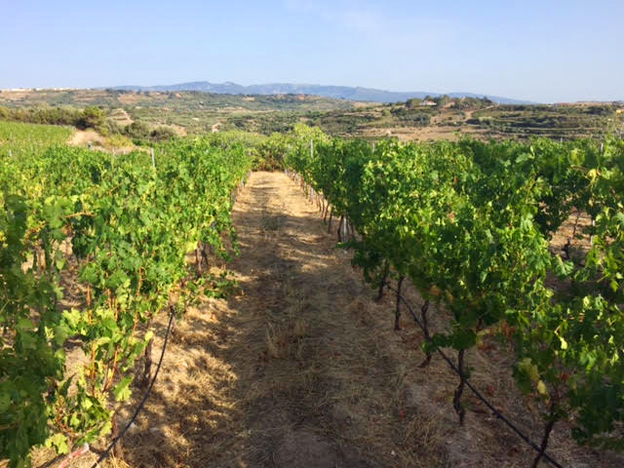 The estate owns two vineyards located in Grand Cru areas for Malvasia di Sardegna; Fraus (in the territory of Magomadas) bought from a relative in 1970, and Campeda (in the territory of Bosa), inherited from a relative in 1980, for a total of 3.5 hectares of vines. The estate only makes two wines, the Malvasia di Bosa Riserva (first made in 1992) and the Alvarega, a Malvasia di Bosa Dolce first made in 2003 and meant to be drunk young. The soils are a mix of calcareous-clayey and sandstone, generally whitish in color and characterized by high potassium levels, low fertility and good permeability. In my experience, there are many wild herbs growing amongst the vineyard rows, such as for example wild mugwort (often a descriptor in wines you might taste.) The terroir is made even more unique by the presence of the mistral, a salt-laden wind that blows in from the northwest, often making the grapes look as if they are covered in bloom with what is in effect a salt patina. Columbu’s top wine, the Malvasia di Bosa Riserva, is currently made entirely from grapes grown in the Campeda vineyard, a true Grand Cru for Malvasia di Sardegna that has long been reputed by locals for its unusually rich, complex wines. Until recently, grapes from the Fraus vineyard were also used, but unfortunately it had to be replanted because it had been ravaged by esca disease. The Riserva is made along traditional lines. It spends three years in 300-500L chestnut barrels. Production guidelines have recently been changed and now require only two years of aging for Malvasia di Bosa Riserva, of which only one must be in wood, while the requirement to use the traditional chestnut wood has also been dropped, leaving many producers unhappy. Columbu has chosen to carry on as they always have. 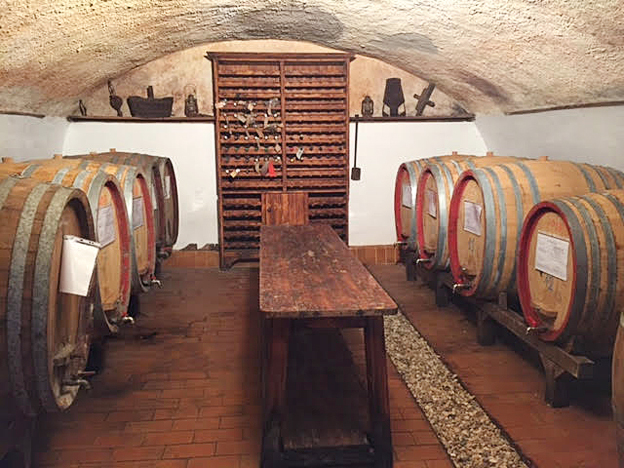 All the sugar in the Riserva is fermented, so the wine usually has around16.5% alcohol. However, Malvasia di Bosa is characterized by noteworthy vintage variation. As this tasting shows, the Riserva can be of essentially two styles, delicately off-dry or bone dry, as the 2006 and 2011 are, or more herbal and austere, as is the case with the 2004 and 2010. Columbu vinifies and stores their wine in the city, rather than in the countryside. They believe that their cellar contributes to the wine’s terroir, because it is cool and the wine always flor-affected. In general, cellars in Bosa have constant temperatures and very high humidity (there is a freshwater spring in the Columbu cellar). The estate did not make a Riserva in 1997 (because of an outbreak of powdery mildew) and in 2009 (because of forest fires.) Production hovers around 6,000 bottles a year are made, 50% of which are sold in Italy. One important thing to note about Malvasia di Bosa is just how remarkably well it ages. In fact, these wines do more than that, because they actually improve over time in truly noteworthy fashion. In this tasting, the older vintages were by far the most complex and interesting, and that is not because Columbu has changed their winemaking over the years, but rather because Malvasia di Bosa has an uncanny ability to improve and gain in complexity with age. When young, Malvasia di Bosa Riserva is delicious but a little straightforward in its oxidative character, whereas at 20-25 and onwards it really comes into its own, becoming a wine of wondrous complexity. According to Gian Michele Colombu, the recent craze for orange wines has helped spark interest in Malvasia di Bosa. As if fascinating wines were not reason enough, the pretty city of Bosa and the local surroundings are more than enough reasons to visit the area. It would be nice to see Malvasia di Bosa make a resounding comeback. The following wines were sourced directly at the winery and tasted with the Columbus in September 2017.